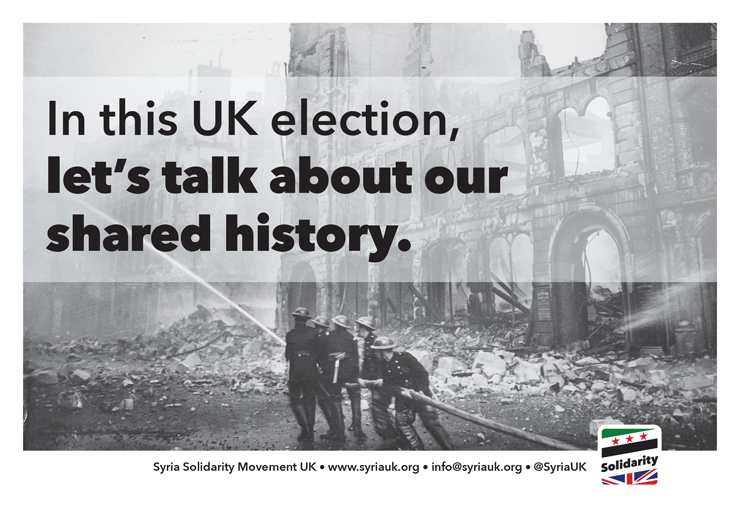 Syria Solidarity UK: In this UK election, let’s talk about our shared history. In this UK election, let’s talk about our shared history. Photo: Firemen at work in bomb damaged street in London, after Saturday night raid, circa 1941. Source: US National Archives. Over 67,000 British civilians were killed in the Second World War. Around 40,000 of them were killed by air raids. When Hitler’s air force attacked, pilots from several other nations joined in defending Britain, including experienced fighter pilots from Poland and Czechoslovakia: the 303 “Kościuszko” Polish Fighter Squadron was amongst the most successful squadrons fighting in the Battle of Britain. Today, more civilians have been killed in Syria than were killed in Britain in World War Two. The vast majority of them have been killed by the Assad regime: over 95% according to records collected by the Violations Documentation Center in Syria. Today, no international pilots have come to defend Syrian civilians from Assad’s attacks. The US-led coalition is intervening in Syria, but not against Assad. He is free to bomb cities and towns and villages with Russian-supplied helicopters and Iranian jet aircraft. Two in five of all civilians killed last year were killed by Assad’s air attacks. Over half the women and children killed in 2014 were killed by Assad’s air force. Anne Frank is a symbol of the millions of innocent children who have been victims of persecution. Anne’s life shows us what can happen when prejudice and hatred go unchallenged. 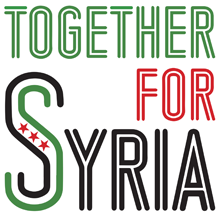 Many leading British politicians have signed this Declaration, including David Cameron and Ed Miliband, but when we look at their actions on Syria, we have to ask how well they are living up to their pledge. On the last day of Parliament, the Coalition Government announced that they were joining the US-led effort to train Syrians to fight ISIS. Earlier it was reported that if re-elected the Conservatives intended to join US-led strikes against ISIS in Syria. Whatever the merits of these policies, they contained nothing to defend Syrian civilians from their greatest threat: the Assad regime. Assad and his allies are responsible for over 95% of killings of civilians. Assad’s forces continue to target civilians with barrel bombs, chlorine bombs, and Scud missiles. 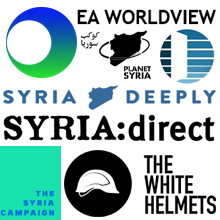 The legal basis for joining US-led strikes against ISIS in Syria would be collective defence of the Republic of Iraq, not the humanitarian defence of Syrian civilians. It would not live up to David Cameron’s promise to “defend those who cannot defend themselves.” For that he would have to back action to stop Assad bombing civilians. As for how well Ed Miliband is living up to his promise: Since he signed the Anne Frank Declaration, Ed Miliband has been talking about his August 2013 decision to block joint UK-US action in response to the Assad regime’s mass killing of civilians with Sarin chemical weapons. But in his telling of the story there was no mention of the men, women, and children poisoned. In his telling there was no mention of standing up to Assad, only of standing up to Obama. Ed Miliband said that his decision in August 2013 proved that he is “tough enough” to be prime minister: “Hell yes.” Many of his supporters seem to agree, and “Hell yes” t-shirts have been produced, celebrating Ed Miliband’s toughness in helping get a mass-murdering regime off the hook. But it has everything to do with that. Ed Miliband’s chosen anecdote to show toughness was to point to the time he prevented action against a mass-murdering dictatorship, one that gave refuge to a key Nazi war criminal, that has tortured its citizens on an industrial scale, that is inflicting starvation sieges on hundreds of thousands of people, that has driven half of the population from their homes, four million of them driven out of the country as refugees, and that has continued killing civilians in their tens of thousands since Ed Miliband said “no” to action. Anne’s life shows us what can happen when prejudice and hatred go unchallenged. When asked about the consequent events in Syria, Ed Miliband avoided taking any responsibility. “It’s a failure of the international community,” he said. But we are the international community. The UK is a key member of the international community, one of only five permanent members of the UN Security Council, and one of only three functioning democracies amongst those five. When Ed Miliband blocked UK action, the consequences were critical. I will try to defend those who cannot defend themselves. Anne Frank was 15 years old when she was killed in the Holocaust. You can read more about her at the Anne Frank Trust, and at the Anne Frank House museum. According to a November 2013 report by the Oxford Research Group, Stolen Futures: The hidden toll of child casualties in Syria, 128 children were recorded amongst the killed in the Ghouta chemical attack: 65 girls and 63 boys. Something of two of those girls, Fatima Ghorra, three years old, and her sister, Hiba Ghorra, four years old, is told by Hisham Ashkar here. The names of 54 of the girls killed are listed by the Violations Documentation Center in Syria. For some, clicking on a name will give a little more information, such as a photograph of one in life, or in death, or their age.